« America’s Most Clueless and Malicious Bureaucrats? What happens when you mix something good with something bad? To be more specific, what happens when you have a big success story, like the spending cap in Switzerland that has dramatically slowed the growth of government, and then expect intelligent and coherent coverage by a government-run media outfit that presumably wants a bigger public sector? Well, the answer is that you get a very muddled story. The mind-boggling…debt racked up by governments…has turned some heads towards Switzerland’s successful track record… Swiss voters approved a so-called ‘debt brake’ on federal public finances in 2001, which was put into operation in 2003. A decade later, the mountain of government debt – that soared to dangerous levels during the 1990s and early 2000s – has been reduced by CHF20 billion ($23 billion) from its 2005 peak. The ratio of debt to annual economic output (gross domestic product or GDP)…fell from 53% to 37% between 2005 and the end of 2012. There’s nothing wrong with that passage. Indeed, you could almost say that Swiss Info was engaging in boosterism. Moreover, the story points out that other nations have been going in the wrong direction while Switzerland was enjoying success. …as Switzerland was chipping away at its mountain of debt, other countries were building theirs up. …Since the middle of 2007 public sector debt alone has soared 80% to $43 trillion, according to the Bank for International Settlements. And the story even notes that other nations are beginning to copy Switzerland. The Swiss debt brake is the perfect model for other countries to embrace… Germany applied its own version of the Swiss debt brake in 2009, followed by Spain and other European countries. …“Switzerland came up with the blueprint for what I am sure will be the standard fiscal model of the future,” said Müller-Jentsch. So why, then, do I think the story has a muddled message? The answer is that there is no explanation of how the debt brake works and therefore no explanation of why it is a success. A reader will have no idea, for instance, that the debt brake is actually a spending cap. Readers also will have no way of knowing that red ink has been controlled because the law properly focuses on limiting the growth of spending. By the way, it wouldn’t have required much research for Swiss Info to include that relevant data. If you do a Google search for “Swiss debt brake,” the first item that appears is the column I wrote in 2012 for the Wall Street Journal. So why didn’t Swiss Info mention any of this very relevant information? Is it because it tilts to the left like other government-owned media outfits, and the journalists didn’t want to acknowledge that spending restraint is a successful fiscal policy? I have no idea whether that’s the case, but there is a definite pattern. When I appear on PBS, the deck is usually stacked in favor of statism. Moreover, you won’t be surprised to learn that I’ve had similar experiences with government-run TV in France. And it goes without saying that the BBC in the United Kingdom also leans left (though at least they seem to believe in fair fights). This video from Swiss Info is similarly vague. It’s a favorable portrayal, but people who watch the video won’t know how the debt brake works or why it has been successful. P.S. I don’t know the details about the German version of the debt brake, but it’s probably having some positive impact. The burden of government spending has not increased in that nation since 2009, at least when measured as a share of GDP. Though the Germans also weren’t as profligate as other nations (including the United States) in the years before they adopted a debt brake, so I’ll have to do more research to ascertain whether the German approach is as good as the Swiss approach. P.P.S. In any event, the moral of the story is that good fiscal policy should be based on the Golden Rule of having government grow slower than the productive sector of the economy. P.P.S. The Princess of the Levant and I continued our tour of the French Riviera. 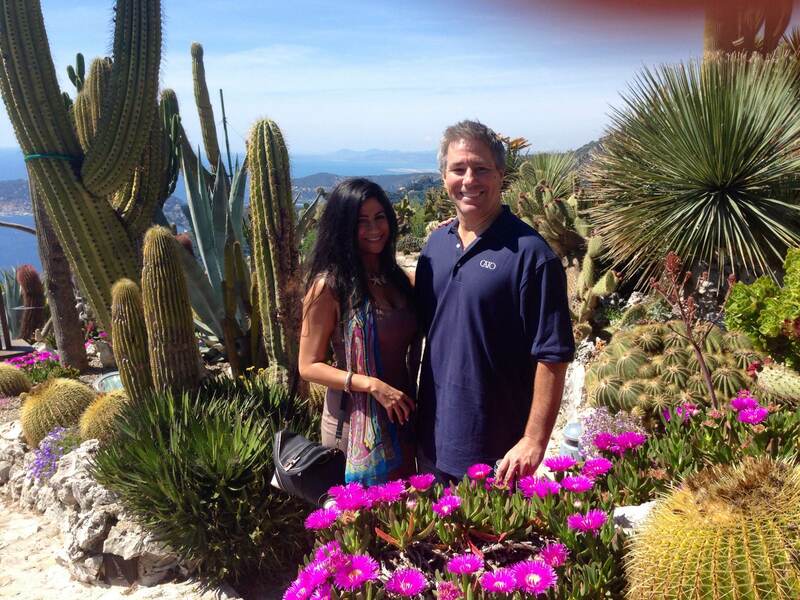 This photo is from Les Jardins Exotiques at Chateau d’Eze. As part of my travels, I’ve learned that the unluckiest people in the world are from Menton and Roquebrune in France. That’s because they were part of Monaco until 1860. So now, instead of enjoying an income tax of zero under Monegasque rule, they are part of France’s wretched fiscal system. You were amazingly restrained in the PBS video. I’m sure it was difficult to sit in on a discussion framed by the moderator as “how to raise more money and make the tax code fairer”. Spitzer certainly got a kick out of your comments. Bartlett has definitely gone to the dark side.